I know I keep harping on about the fact that a Mumpreneur wears so many different hats on a daily basis and this post will deal with the guilt related to that. When you stop to think about it how often have you actually written down all the different titles you have? 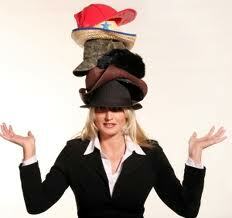 As a mother there are quite a few hats already, now add working into that mix and you add a few more. To top it off add starting and running your own business onto that list and the amount of hats that you wear becomes staggering. That is excluding the wife/partner, daughter/sister and friend titles that get added as they are also part of your daily life. It is trying to be perfect under all of those hats instead of being human under them that causes so many Mumpreneurs to feel guilty. For me guilt is a luxury we often indulge in when we are at the cusp of change. It is a nice little safety net to hide in because we don’t want to make those choices which will cause us to make changes to the lives of those around us too. I often hear women in general sigh and say “men, they’re just so selfish, they don’t consider me or the kids in that decision” and they are feeling put upon. Often that “decision” revolves around his personal time which she feels should be devoted to family time instead. However that is something that will never be fixed while she plays the martyr and continues to moan about it without making the uncomfortable choices that go along with those changes. Be honest here ladies, that is exactly what we do, “poor put-up me and I’m powerless to change things” when we really don’t want to deal with it properly. So many times a Mumpreneur put her business last in the list and then wonder why it is not growing at the rate that she had planned for, yet she is still hiding behind the guilt that she feels. * Guilt that she’s not growing her business at the rate that she wants. I regularly deal with guilt on my Cute Honey Lite trainings, it depends on the needs of the group on the day, sometimes a more pressing issue arises that they want to deal with. I always follow-up with my clients to find out how they are doing. With quite a few of the attendees on the follow-up, I have been told they were following up on the goal they had set, that they were finding it difficult, but were getting there. Others said that it made a huge difference to them, you can read what they have said here. Recently I was sent a copy of feedback of a Mumpreneur who had been to one of my trainings. She had said elsewhere that she hadn’t found my training very good as it didn’t deal with her issues around guilt. Unfortunately that was her primary reason for attending as opposed to the business training she would receive. To me, she said she was happy with the training, found it really useful and good. Even on the follow-up she was upbeat and positive, at no point did she mention that she felt let down. I know that the business training I provide is top quality. I know that it helps Mumpreneurs get results that they both need and want, however I also know that I won’t please everyone and while it is disappointing that it doesn’t, I won’t beat myself up trying to. Nor will I indulge in a self-imposed guilt trip because I can’t please everyone – that would take from my productivity. I do know that when that Mumpreneur gets real with the changes she needs to implements, that she is reluctant to do now, she will start to see results and the guilt will subside, until then it won’t. Have you been caught up in the trying to please everyone trap? How did you deal with it and how would you advise another Mumpreneur on dealing with it?